This week we are profiling some interesting first crop offerings at the upcoming Fasig-Tipton July Yearlings sale. Click here for a complete list of Fasig-Tipton July TrueNicks reports. This is a very clever pedigree. The Unbridled’s Song/Mt. Livermore cross is a very good one as Mt. Livermore in general loves more Rough’n Tumble, and Unbridled has two strains of this stallion. Interestingly the third dam of this yearling colt is a three-quarters relative to Champion sire Fappiano, who is in the great-grandsire of Half Ours (TrueNicks,SRO) giving close genetic relatives top and bottom of the pedigree, a pattern we have seen to success previously. Click the thumbnail for a full-size TrueNicks report. 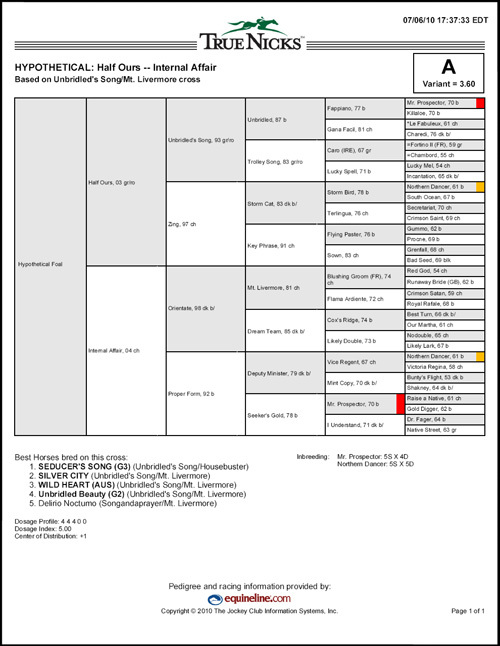 Quite a lot of clever line breeding in this pedigree. Purim (TrueNicks,SRO) goes back to Aspidistra (dam of Dr. Fager) and this colt's dam is out of a mare by Fappiano's son Roy, with Fappiano being out of a Dr. Fager mare. 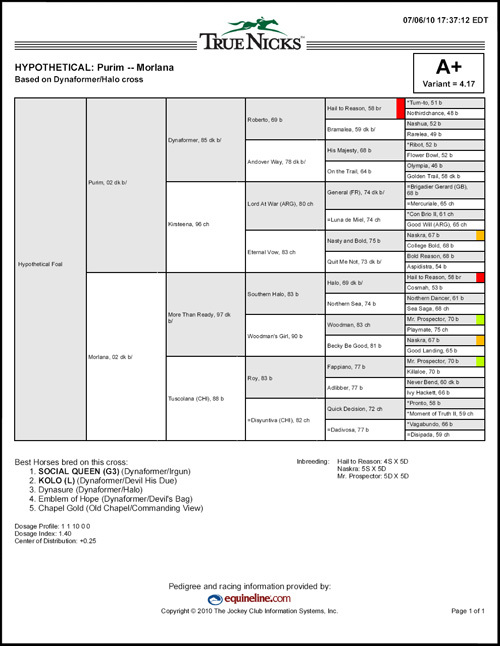 Roy also carries Never Bend, whose half brother Bold Reason appears in Purim, thus giving a double of Lalun, while Nasty and Bold (sire of Purim’s second dam and descending from La Troienne) has combined well with More Than Ready (TrueNicks,SRO). Morlana also carries two strains of Mr. Prospector, which Dynaformer (TrueNicks,SRO) has been particularly effective with. Click the thumbnail for a full-size TrueNicks report.